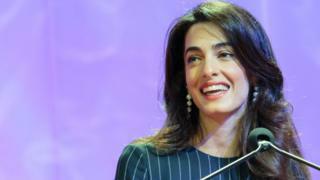 Human rights lawyer Amal Clooney has been appointed as the government’s special envoy on media freedom, the Foreign Office has announced. Ms Clooney and Foreign Secretary Jeremy Hunt will work to “counter draconian laws that hinder journalists from going about their work”, the FCO said. Mr Hunt said violence against reporters had reached “alarming levels globally”. Ms Clooney, who will not receive a fee for her work, said she was “honoured” to take on the role. “Through my legal work defending journalists I have seen first-hand the ways in which reporters are being targeted and imprisoned in an effort to silence them and prevent a free media,” added Ms Clooney, who last year joined the legal team defending two Reuters journalists detained in Myanmar. In 2015, she was part of the legal team working towards the release of two Al Jazeera journalists jailed in Egypt. More recently, she represented Nadia Murad – a Nobel Peace Prize winner who was captured and tortured by so-called Islamic State. Mr Hunt said Ms Clooney’s experience made her “ideally placed” to ensure the UK’s efforts to protect global press freedom had “real impact for journalists”. In 2018, 99 reporters were killed, 348 were detained and 60 were taken hostage worldwide, the FCO said.